MOBILIARIO COMERCIAL MANIQUIES is a young company, formed by a group of highly qualified professionals with full knowledge of the market that have a wide expeciencia in the field of commercial furniture and decor stores. We are willing to personally advise looking for solutions that best fit their expectations and commitment that we have no reference point in their projects of commercial equipment. It is created with the firm intention of offering a personalized care furniture and business equipment for decorating shops, businesses, or even households with new ideas and following the trends of each sector. We are located in Pinto (Madrid), but our window to the world is the internet. We made a big bet on new technologies to be present in more places offering quality products and services. We have excellent partnerships with major freight forwarders that we provide our clients to bring our products to all parts of Spain and the European Union. Shop Online. We give them access to a wide range of products for decorating stores, such as commercial furniture, commercial equipment and accessories. You can view the latest news and special offers and keep you informed and keep up to date on the most appropriate commercial furniture for your establishment. We have a wide variety of accessories for your shop, counters, shelves, displays, panels designed for the commercial interior design with systems of quality and avant-garde, shelves, racks, cabinets. 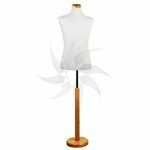 We are also dedicated to the sale of mannequins, to complement the needs thus requiring his window.